If your looking to upgrade your iron to something a little more powerful, or if your looking for a quality steam iron that will handle expensive high end clothing with care, then the Bosch TDA5080GB Steam Iron with SensorSecure could just be the perfect match for you. The TDA5080GB is a nice looking iron aesthetically speaking. It comes with an aqua blue and black color pattern. The shape of this steamer is very sharp as well, with a really nice symmetrical design that is quite compact and laid out intelligently. Upon first inspection this iron looks the part, and in my opinion look wise it outdoes most of the competition in it’s price range, and even some in a higher price range. 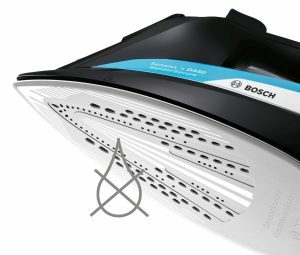 This SensorSecure Bosch iron is an absolute pleasure to use. The features and over all construction have made it very user friendly. This iron heats up very quickly, it also stops steaming/heating when you place it down, which will avoid any unwanted over-steaming or burn marks. The base plate has a matte finish to it, which is a change from the usual polished finish on most irons. The matte finish does give it a slightly different feeling when ironing, it doesn’t feel as slippery but allows you to press out wrinkles a little better. The TDA5080GB is slightly heavier than other steam irons of the same size due to it’s stronger ceramic baseplate and thicker plastic casing. The weight of the iron isn’t significant enough to tire your arm out any quicker than a slighter lighter one, but it does seem to aid in decreasing wrinkles both small and large. 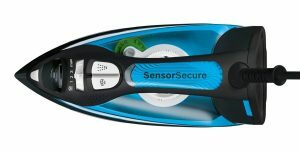 The cable is very long and thick, ensuring you get a long life out of the SensorSecure iron. The 3 meter length of the cable also makes it easy when moving around the ironing board. If adequate steam production is a concern for you, then your in luck because the TDA5080GB over-delivers in this department. The steaming efficiency and penetration into the clothes is one of the best I have experience for an iron in this price range. There is a button near the handle that you can push to shoot out a motor generated steam shot. The steam shot is strong and shoots 200 grams of water! You can use this steam boost in both horizontal and vertical positions. Bosch has stated that this advanced steaming technology gives a 45% moisture penetration advantage compared to other models. Another very handy feature on this SensorSecure is the “DripStop”. If you iron frequently you may be very familiar with the over secretion of water some irons seems to produce, which creates drips and water stains on your clothes. 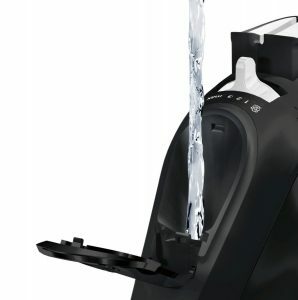 You wont experience this with this Bosch device, because of the new feature they have created which monitors and limits the amount of water released. 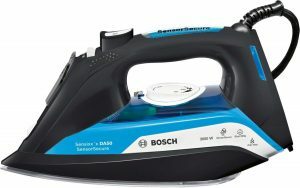 Bosch has done an excellent job feature wise with this iron, which reflects in the over all outstanding performance. I don’t really have any complaints with this steam generating iron, and I haven’t really read of any negative reviews from others as well. If your looking for a hassle free ironing experience make sure to have a good look at this steaming machine.